0600-0800 - ROWING. This week I’ve been paired with Joey Mile and as Captain Safety he makes sure we’re always lashed on before going on deck. Stay safe and strap up! Although we have crossed two time zones, we are still working in GMT so this shift as I write is still in darkness. 0800-1000 - REST. Wet weather gear off, failed attempts to get dry and personal bum admin. This is also usually the best sleep of the day after a long night on the oars - 90 minutes if you’re lucky! Just before 10 I usually check GPS and log position, and then tick another tally on the wall of Days Done! 1000-1200 - ROW. During this time the other pair (currently goldilocks kids Chaz and Dave) do the bulk of the morning jobs - throw away any uneaten food (getting less and less by the day as our stomach for freeze dried chilli improves), clean salt off the solar panels (very important) and start the water maker. This machine uses the bulk of our power each day and is the thing we have been most precious about on cloudy days. 30L usually does us. 1200-1400 - FOOD! First proper feed of the day for Joe and I - muesli plus another traditional breakfast meal - usually curry or pasta! Mmmmm. The cabins are like saunas and if we can, we try and stay out on deck where it’s a bit cooler. 1400-1600 - ROWING. In the heat of the day this is hats on and plenty of water. 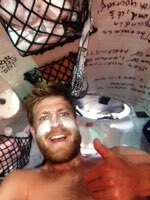 Zinc sunblock has also made an appearance since crossing into the tropics - although looking more like a Zulu warrior than an Ocean Rower see pic below! 1600-1800 - THE BIG FEED. 3 freeze-dried meals and 1500kcal straight down the hatch. Mac and cheese a particular favourite amongst us. Charlie is also a fan of pasta lasagne sauce. 1800-2000 - ROW. Probably the nicest shift of the day as a bit cooler. 2000-2200 - REST. Start munching on snack packs (another 2500kcal of nuts, cereal bars and beef jerky that we try and get through on the night shifts. Try and catch a quick cat nap. 2200-0000 - ROWING. If we’re lucky the stars and moon are out. More recently the moon had stayed at home, so we haven’t seen the waves come crashing over the deck until they’re in our laps. Wet weather gear, hoods up all the way. 0200-0400 - ROW. The graveyard shift! Common place to fall asleep on the oars. Charlie has made a new friend with a life jacket harness that makes him look like a drummer. Joe sings Justin Bieber. Dave drinks a lot of water. While three weeks at sea is a big milestone for us, we are cracking on towards half way as fast as we can. Whilst calmer seas and slower progress is frustrating we are trying to enjoy a chance to dry everything out before the prospect of some big weather to come after the weekend.